Helen Cuervo, formerly the district construction engineer, was recently named Northern Virginia District Administrator. The NoVa District includes the counties Fairfax, Arlington, Loudoun and Prince William. As construction engineer she was "responsible for the delivery of the $700 million Northern Virginia District construction program. Cuervo joined VDOT in 1987 as contract administrator and later served as land use director assistant district engineer." FABB recently met with Ms. Cuervo and other VDOT staff to discuss the Fairfax County Parkway Trail closure. She was supportive of our request that trail closures be treated the same as road closures, with prior notice and signed detours. She noted that it is VDOT policy to provide adequate access for pedestrians and bicyclists and staff had plans for three current projects that showed that temporary access is now standard practice. Congratulations to Ms. Cuervo and we look forward to working with her in the future. National Bike to School Day on May 8th. Multiple organizations in the Greater Washington area join together with schools from around the country to celebrate National Bike to School Day on May 8 2013. Thousands of students throughout the area will be riding or walking to school along with parents, teachers and community leaders. Leaders from the Washington Area Bicycle Association, BikeArlington, Fairfax Advocates for Better Bicycling, TrailsforYouth, Prince William Trails and Streams Coalition and the Greater Washington DC Region Safe Routes to School Network, all encourage parents to leave their cars in the driveway and join their children in riding to school on May 8th. To date over 70 schools in the Greater Washington DC region have signed up to participate in National Bike to School Day. More are expected as the day gets closer and are encouraged to register their school at www.walkbiketoschool.org. Julie Childers, Executive Director for TrailsforYouth.Org who has been implementing SRTS programs locally for over 5 years has this to say, "It's fantastic to see such interest and involvement within the Metro DC communities for promoting biking to school. I hope that we see continued grow and more kids safely riding their bikes to school." Bike to School Day encourages a nationwide bike-focused celebration for students in the month of May and builds on the popularity and success of International Walk to School Day, which is celebrated across the country – and the world – each October. “BikeArlington and WalkArlington have been coordinating with Arlington Public Schools and the response has been tremendous. All Arlington elementary, middle and high schools will be celebrating biking and walking to school on May 8”, says Chris Eatough of BikeArlington. Bike to School Day events raise awareness of the need to create safer routes for bicycling and walking and emphasize the importance of increasing physical activity among children, pedestrian safety, reducing traffic congestion and concern for the environment. The events build connections between families, schools and the broader community. For additional information, please visit these websites or contact Christine Green at christine@saferoutespartnership.org. VDOT is holding a public information meeting on proposed changes to the I-66/Route 28 interchange. Cyclists are encouraged to attend the meeting to find out how bicycle travel will be affected by the project. 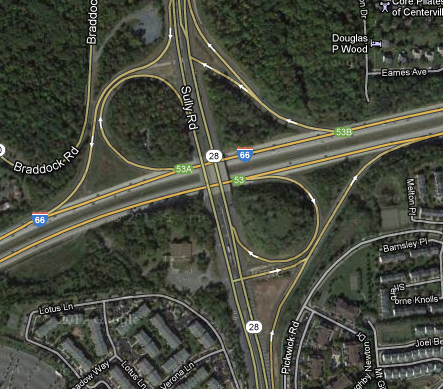 Both I-66 and Route 28 are major barriers for bicyclists in that area. Looking at the image on the right, it's impressive how much space is devoted to the road system at this intersection, much of which is unusable inside the cloverleaf. Nearly of that space is bike-unfriendly. 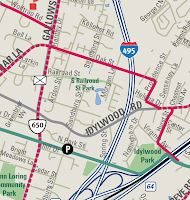 From this section of the Fairfax Co Bike Route Map you can see the lack of bike facilities. A stakeholders meeting was held in May 2012. None of the comments at that meeting addressed the need for better bike/ped access in this area. Join VDOT for a public information meeting on this project on Monday, April 29, 2013 at Stone Middle School, 5500 Sully Park Drive in Chantilly. Stop by between 6 and 8 p.m. to view displays, learn more about the project and ask VDOT staff your questions. Email or mail your comments by May 9, 2013 to Mr. Leonard Siegel, P.E., 4975 Alliance Drive, Fairfax, VA 22030. This study will identify interchange alternatives, create a concept-level operational analysis, develop cost estimates and identify key implementation constraints. Study results will be shared with the community and stakeholders, and next steps will include identifying funding. There is currently $5 million of funding allocated for preliminary engineering of improvements at this location. Uneasy riders: Adults trying to get steady on 2 wheels is the title of a front page article in today's Washington Post (with a different online title). Many adults never learned to ride a bike. Now that cycling has become more popular, many of those adults are signing up for "learn to ride" classes. 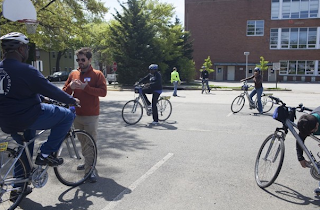 This spring WABA is holding 14 very popular adult-only Learn to Ride classes in DC, Arlington, and Alexandria. Similar classes are also offered at local REI stores. The technique used involves removing the pedals and lowering the seat so that students can gradually learn to balance and steer the bike. Once balance is learned, one and then both pedals are replaced. It takes a surprisingly short amount of time for adults to learn this skill that can be used throughout their lives. The instructors talk about the glow that comes over the faces of adults who finally break through, vanquishing a secret fear that has dogged them since grade school. Hoagland had a woman burst into tears the previous week at an Arlington class. Another student bought his training bike as soon the session was over. “It’s the best part of my job,” Hoagland said. Anthony Mansell, 25, a climate change activist who lives near U Street in Northwest Washington, grew up in a rural part of Wales where he never learned to ride. Mansell plans to sign up for Capital Bikeshare, which allows users to check out bicycles from stations around the region. Several students mentioned the wildly popular program (it passed 4 million rides earlier this week), as well as other spokes of the bicycle boom that has enveloped Washington in the past decade. The District has gone from three miles of dedicated bike lanes in 2001 to 56 miles today. The percentage of workers commuting by bike has tripled in that time. With several FABB members trained as League of American Bicyclist Cycling Instructors (LCI) I'm hoping similar classes can be offered here in Fairfax in the near future. Private lessons are currently available. Thanks to Alan and his extended family, including the two dudes in the photo, for representing FABB at SpringFest today. They had an excellent turnout including many young families. We hope some of those families plan to celebrate National Bike to School Day on Wed., May 8. Find out more about BikeFest here. BikeFest will sell out, and tickets will only be sold until Thurs., May 2 at 11:59 p.m. Get your tickets now! Be Fit McLean Outdoor Expo—We'll have a table at this popular outdoor expo handing out Fairfax County bike route maps, promoting Bike to Work Day on May 17, and giving bike route advice. Nelle Pierson of WABA will be helping out at this event. The event will be held at the Old Firehouse on 1440 Chain Bridge Rd., McLean from 10 a.m.-4 p.m. There is a $5 admission fee. Most vendors will be handing out free stuff. SpringFest—Sponsored by Clean Fairfax, this festival is "a celebration of Earth Day, Arbor Day, and a Cleaner, Greener Fairfax!" 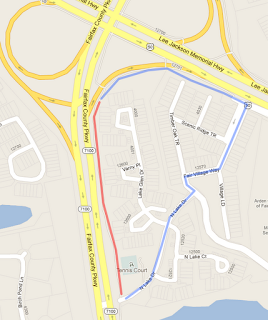 FABB will have an information table and be discussing bike routes in southern Fairfax. The event is located at Workhouse Arts Center, 9601 Ox Road, Lorton Virginia, 22079 adjacent to the Route 123 multiuse trail and near the Cross County Trail, Occoquan Regional Park and the town of Occoquan. Paul's Ride for Life—FABB supports Paul's Ride by serving on their Board of Directors and as ride marshals. Riders can choose from 10, 20, and 50 mile routes starting at the Reston Town Center on Library Street in front of Uncle Julio’s in Reston. This is a change in start location from prior years. A grass-roots coalition of Reston residents working with the Reston Association Pedestrian & Bicycling Advisory Committee (PBAC) have coordinated nine different schools to create a Reston-wide focus on National Bike to School Day on May 8. Although many of the schools in Reston have participated in Bike to School Day individually, this is the first time they have come together in a focused and collaborative manner around the event. The organizers hope that this collaboration will help build more awareness and be the starting point for future rides and opportunities. The event has already provided an excellent exchange of resources and innovative ideas centered around cycling and walking to school. One highlight of the event is a friendly competition between schools to see who can get the most bikes on their bike racks. The organizers understand that just “getting one more bike on a rack” at our area schools will be a success! Almost four years have passed since I finished chemotherapy, and I am still cancer-free. (I am taking a five-year course of tamoxifen, which blocks the effects of certain hormones, to help prevent a recurrence.) Riding has continued to be a refuge and an inspiration to challenge myself. I ride about 600 miles per month, most of it commuting. I have completed several centuries (100-mile rides) and a few local events. Last fall, I was certified as an instructor by the League of American Bicyclists, which means I can teach beginners and cyclists wishing to improve their traffic riding skills. My husband and I are also training our son’s Boy Scout troop for a four-day, 187-mile bike ride on the C&O Canal towpath this summer. I’ve realized my goal when I started bike commuting. By using my bike to get groceries, go to and from work and do many other things I need to do, I can maintain my fitness while going about my life. My well-being is the priority it always should have been. I have a well-rehearsed answer when someone asks, “Is it safe?” Eighty-five percent of my commute is on a protected trail or bike lane. After all these years, the urban drivers and I know each other well and have long since made peace with our imperfect coexistence. But really, I just want to reply, “How is it safe not to?” I’m a human being, a living creature. I wasn’t meant to be passive. I was meant to be out in the world, to move, to power up a hill panting, to go flying down the other side as if ready to take flight. To feel the hot sun beating down on my back, to gingerly brace myself against a fierce crosswind on a dark, frigid night. To overcome the tedium of thousands of pedal strokes over the same route, day after day, by making it transcendent. To do more than exist — to live. It was appropriate that most of today, Earth Day, was spent on bike advocacy. The day started with an interview on the local TV show Reston Impact hosted by John Lovaas. We joined Anne Mader of The Bike Lane for a second show taping, this time we discussed biking to Metro and using the soon to open bike room at the Wiehle Ave Metro station that is part of the Comstock development Reston Station. The first show is viewable online. Anne discussed some of the challenges of having a family, owning a business, and using bikes for transportation. She showed a good photo of her husband Todd taking one of their kids to school on the back of their cargo bike. Her kids assume they will be riding to school; it's just part of their daily routine. Next I rode to a meeting at VDOT headquarters. I chose a route that would take me past the Fair Lakes/Fairfax Co Parkway construction project where the Parkway trail was closed for over a year. The trail is now open but still unpaved and there's still work underway. As you can see from the photo on the right, the trail was blocked yet again but the crew thankfully stopped what they were doing and guided me past. The project should be finalized in a little over a week. The meeting at VDOT was to review plans for temporary bicycle and pedestrian access on three projects; Stringfellow Road widening south of Route 50, Telegraph Road widening at Kings Highway, and a small project at Nutley Street and Route 29. The Nutley intersection is near the Vienna Metro station and is heavily used by bicyclists and pedestrians. It was encouraging to see that ped/bike detours are an integral part of the plans for each of the projects, including the very small Nutley Road project. The Stringfellow Road project will last for a couple of years, so it's critical that safe, well-signed detours are provided for pedestrians and cyclists. Frog Branch Trail and Big Rocky Run Trail are both affected by the construction and detours will be provided. After the meeting I rode along Fair Lakes Drive to Stringfellow Road where the above-mentioned project is underway. I was a little dismayed that the trail was blocked just north of Melville Lane near where the northbound detour is supposed to begin. The detour signs were up but were covered. The crew blocking the trail stopped what they were doing and let me pass; I assume the detour will begin soon. Further north there were three road warning signs placed in such a way that they blocked half of the trail. When I reached Poplar Tree Road there was a police cruise blocking the sidewalk and ramp on the NW quadrant. A policeman was manually working the traffic signal to try to ease the congestion caused by the one-way traffic on Stringfellow just north of there. Schools were letting out and traffic was a mess. I suggested there were other places for him to park, such as a spot adjacent to where he was standing or just around the corner. Maybe he'll think twice about blocking the sidewalk the next time he's there. Sunset Hills/Wiehle intersection. FFX Co has long term plans to provide a bridge over Wiehle Ave at the W&OD Trail crossing. For the short term the county is considering "improving" the crossing by moving it to the Sunset Hills intersection and having trail users cross at the traffic signal. I see a couple of problems with this solution. The signal timing is not favorable for pedestrians and cyclists, who legally can only cross at a signalized intersection when there is a WALK signal. At the Sunset Hills crossing of Wiehle there are 5 seconds out of every 2 minutes when trail users would be able to legally enter the crosswalk and cross. The other problem is that there are many potential conflicts between motorists turning right on red, who rarely come to a complete stop and usually just look to their left. There is also left turning traffic from eastbound Sunset Hills that could lead to conflicts. I don't think that it's been shown that crossing at the intersection is any safer than the current crossing. In fact, I think it's more dangerous. Since there is so little legal crossing time, many trail users would choose to cross when it's not legal, putting them at fault if there's a crash. We'll discuss our concerns with FFX Co.
Update: I didn't mention that I noticed today that some spot repairs have been made to the Fairfax County Parkway Trail. Several potholes and large gaps in the trail have been filled in with asphalt. Most of the trail needs to be repaved, but until then, these small spot repairs help make the trail safer. Thanks to VDOT for doing this work. We have heard that VDOT has funds for doing some major repair work on the Parkway trail. Not enough to repave the entire trail, which would cost around $4-6 million, but enough to fix some of the worst sections. Fairfax County recently released their first Greenhouse Gas Emissions Inventory. It shouldn't be surprising that 37% of greenhouse gas emissions in Fairfax Co. come from transportation. Cyclists contributed 0.0% of those emissions, at least while riding their bikes. It would have been nice had bicycling been mentioned in the report. Perhaps when the Silver Line service begins this will change, but 70% of the increase in emissions between 2006 and 2010 was from commuters passing through the county. Sprawling development in Loudoun Co. didn't help. In total, residential, commercial, industrial and government buildings’ consumption of electricity, natural gas and fuel oil produced 63 percent of the total emissions. Transportation accounted for 37 percent. Between 2006 and 2010, total emissions from passenger cars increased by nearly 4 percent. Emissions associated with commuters passing through the county to other destinations accounted for 70 percent of the increase. This trend demonstrates how mass transit, like Metro, can reduce greenhouse gases. This is one reason Fairfax County is concentrating future growth in urban centers served by transit, such as Tysons. Transit-oriented development combats sprawl, reduces traffic congestion and curbs greenhouse gas emissions. We recently attended the VDOT Statewide Bicycle and Pedestrian Advisory Committee meeting held in Richmond on March 27 at VDOT offices. The committee was originally formed in 1989 as the Bicycle Advisory Committee. The committee has only met very sporadically in the past. It was last convened to work on the State Bicycle Policy in 2011. Following are my minutes from the meeting. FABB does not have a member on the committee. In our role as WABA board member we represented Shane Farthing, WABA Executive Director. John Bolecek will chair the committee. He plans to hold two BPAC meetings/year. Membership consists of statewide stakeholders. As an observation, there were no representatives from the retail or consulting sector. Pedestrian Policy Plan - The Plan is being developed using internal and external working groups. HNTB is the consultant. It will be a companion to the Bicycle Policy Plan. Beaches to Bluegrass Trail is a joint project with Department of Conservation & Recreation. It will be an off-road trail that parallels Virginia's southern border from the Virginia Beach area to the Blue Ridge. There was some discussion about the need for more on-road cross-state bike routes. Planning Database - VDOT has implemented a pilot project in which local bike/ped plans in the Culpeper and Salem Districts are digitally compared with maintenance and paving overlays to help prioritize spending of the 2% shoulder funds. The goal is to implement this system in all districts to foster better cooperation between the VDOT Maintenance program and localities. Recent Bicycle Improvements in Northern Virginia - Randy Dittberner of VDOT gave an overview of the Lawyers Road road diet project. He also discussed implementation of Bicycles May Use Full Lane signs and shared lane markings, mostly in Fairfax County. Randy was asked if a road diet is implemented, are maintenance funds reduced because regular travel lanes are reduced. No clear answer was provided. The topic will be investigated. Randy noted that an RRFB (Rectangular Rapid Flash Beacon) will soon be placed at Belmont Ridge and the W&OD Trail. There are currently 4 or 5 in place in Fairfax. RRFBs have been approved for experimental use throughout Virginia. VA Supplement to the MUTCD - VDOT is revising an earlier version of their supplement to MUTCD. Comment period was Nov 1-27, 2012. The revised supplement is expected to be issued any day now. There will be more options for using shared lane markings. There will be more detailed guidance regarding where to place the shared lane markings in relationship to the curb and edge of the roadway. Multimodal and Public Space Design Guidelines - This effort was mentioned several times when the discussion turned toward use of urban design standards and more innovative bicycle facilities such as those contained in the NACTO Bike Guide. The Multimodal Design Guidelines are being developed by DRPT with close coordination with VDOT and a large steering committee. "The target audience and purpose of the guidelines is to provide transit agencies, local governments, land use and transportation planners, as well as the private sector with a toolkit of planning approaches, policies, guidelines and implementation strategies to help create and transform communities into multi-modal, economically competitive and environmentally friendly areas that improve the overall quality of life for residents, visitors and businesses." The Draft Multimodal and Public Space Design Guidelines are available online. Safe Routes to School - Rob Williams, VDOT Safe Routes to School coordinator, gave an overview of the program. Fairfax submitted an application for funding of a countywide SRTS coordinator position. VDOT is reviewing current non-infrastructure applications and will decide by early summer. Quick start grant application deadlines ($1,000) are April 18 and May 16. Shoulder Paving Program - Robert Prezioso, VDOT, gave an update on the 2% of maintenance funds that are set aside for providing space for bicyclists on the shoulder. Maintenance staff are reluctant to use these funds since they limit the length of roadway that can be paved. Shoulder paving is often limited by the available right of way or by existence of ditches near the road which would require some construction, which is not part of the shoulder paving program. Statistics for the amount of money spent, and length of shoulder paved, were provided for almost all VDOT districts. The NoVa district maintenance office did not provide any data. There was extensive discussion of the need for wider shoulders. Two foot shoulders provides very little room for cyclists. Some argued they prefer no shoulder to an inadequate shoulder. Others argued than any shoulder gives cyclists some room and is the basis for providing a wider shoulder later. It was noted that the 6' vinyl lane strip next to a two foot shoulder makes the shoulder almost useless. Reta Busher, VDOT Chief of Planning and Programming, said that since the new federal transportation bill requires states to meet performance measures, there will be more pressure to use maintenance funds for the road and not the shoulder. It was pointed out that 68 Congressmen recently asking USDOT to create separate performance measures for bicycle and pedestrian safety in part to counter pressure to divert bike/ped funds based on the new motorized performance measures. Promote VDOT participation at the LAB Summit and in APBP activities. Notes and presentations from the meeting should be available in the near future. Over 350 riders have signed up for Paul's Ride for Life. The ride raises funds for organ donations in the name of Paul Rossmeissel: "Our objective is to remember Paul's enthusiasm for life, celebrate his love of cycling, and raise money for the Washington Regional Transplant Community (WRTC)." 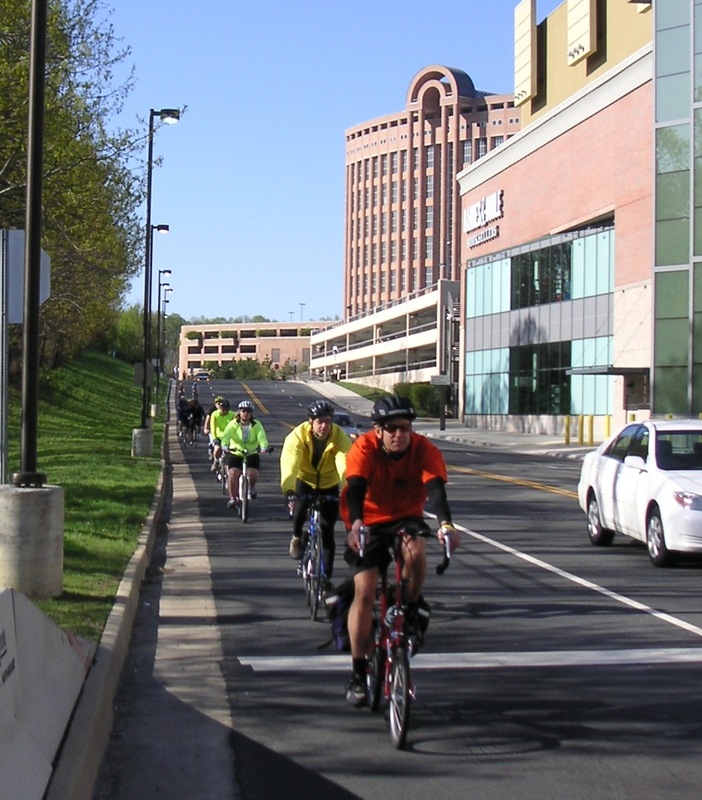 Rides start at the Reston Town Center with options of 10, 20, or 50 miles. "Registration, ride start and finish, closing ceremony, and raffle drawing are all at the Reston Town Center on Library Street in front of Uncle Julio’s in Reston, VA. Following Paul’s Ride, riders may enjoy participating in the Great Grapes Wine and Food Festival beginning at Noon. Both Paul’s Ride and the Reston Wine Festival are rain or shine events." To learn more about Paul's Ride see the Reston Bike Club April newsletter. 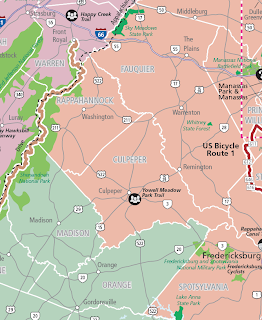 VDOT is updating the official state bicycle map, Bicycling in Virginia. See our comments on the last map revision. VDOT has these comments and will consider them during this revision process. Our main comment is that there are many good bike routes in Virginia, mostly on quiet rural roads. Bike Virginia uses these roads on their tours and they are a great way to discover the diversity of the state. We would like to see a bike map that includes many more routes criss-crossing the state. On the current map, in counties, like Orange, Nelson, Culpeper, Buckingham, etc. there are no routes. There are some excellent bike rides in Faquier Co. but only the short segment of US Bike Route 1 is show in the southeast corner. It would be a major undertaking to develop the routes but we think it would be worth the effort. 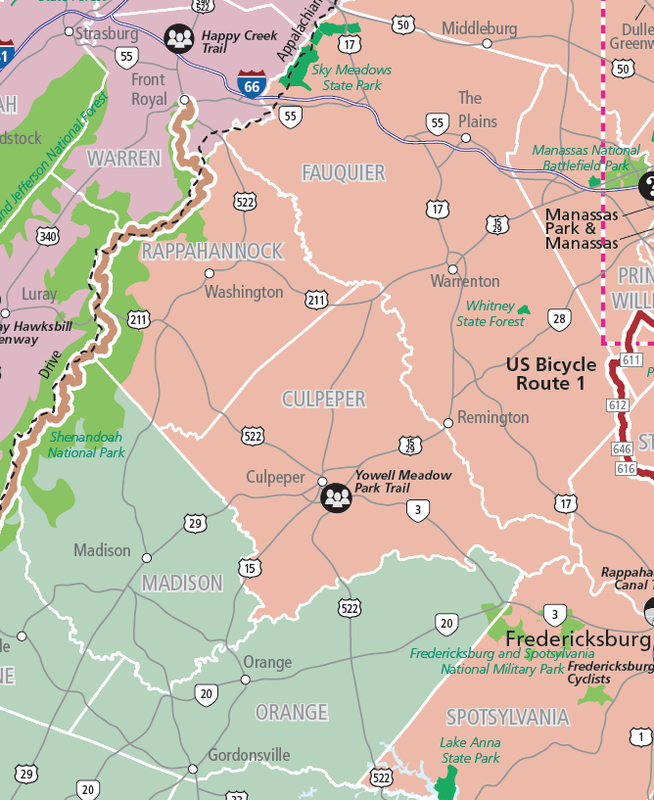 VDOT would like your feedback on the Bicycling in Virginia Map. Are you aware of any new trails, bicycle clubs, or other features we should include when we update our map? Have you noticed any typos or errors? If so, please submit your comments below to help improve our map, your responses will be kept private. What to Expect at BikeFest? Tip your top hats to bicycles by coming out to our fanciest event of the year. There will be live jazz and swing music to get your hips swayin’ and we are bringing in professional dealers and card tables to make your gamblin’ hands feel like Humphrey Bogart at Rick’s Café in Casablanca. Once your chips stack up after playing blackjack, roulette, craps and poker, you can trade them in for tickets to win bike-themed prizes. BikeFest will also feature a silent auction with “experience packages” and vintage bike art, so come prepared to shop! The BikeBuild is back again for the third annual contest. Local shops build their own creative, innovative, sometimes wacky build for the occasion and guests vote at BikeFest for their favorite bike. The shops will auction off their new creations and the shop winner will get bragging rights and a trophy. If you’d like to dress up, please do. So gentleman, shine your shoes and don that suit and bowtie. Ladies, show us your highest heels and most sparkling attire. And everyone, practice those gambling hands as we get the dice rolling for BikeFest 2013. A big thank you to WABA’s generous BikeFest 2013 sponsors: The Boeing Company, Chipotle, Signal Financial, CH2M Hill, Toole Design Group, and Entertainment Sound Production. Buy your tickets now for BikeFest 2013. Space is limited and we will sell out! Tickets are $45 for members (You received your member discount code in your inbox. You will need that code to get the member price.) or $55 for the public. FABB recently met with several representatives from VDOT to discuss the closure of the Fairfax County Parkway Trail between Route 50 and Fair Lakes Dr. The trail was closed for over a year with no detour provided. We've written extensively about this trail closure. The purpose of the meeting was to determine why the trail was closed without a detour and to get some assurances that this type of closure will be avoided in the future. The folks at VDOT explained that their policy when a pedestrian or bicycle facility is closed dictates that "alternate pedestrian routes shall be provided." We were told that the project was funded using stimulus money and was on a fast track. In order to provide temporary access, additional right of way was needed or several trees would have to be cut down. The detour that we recommended back in August was on private roads and there was some discussion about whether it was possible to route trail traffic through that area. Our response boiled down to asking that trail closures be treated like a road closure: Avoid if at all possible, provide a detour, close for as short a time as possible, provide advance notification, provide ongoing notification regarding status of the closure, and provide information about alternative routes if a detour is not provided. Cyclists don't need the huge electronic message signs. NVRPA often uses page-size laminated signs to provide information to W&OD Trail users and those signs work fine. Cyclists travel at much slower speeds than motorists and we can stop to read that type of sign. We were very encouraged to hear that the folks at VDOT are taking this issue more seriously than in the past and are making provisions for temporary trail access in future projects. This attitude needs to filter down to the crews doing the work because all too often TRAIL CLOSED signs are put up with too little consideration given to the consequences to bicyclists and pedestrians who often don't have reasonable alternatives. 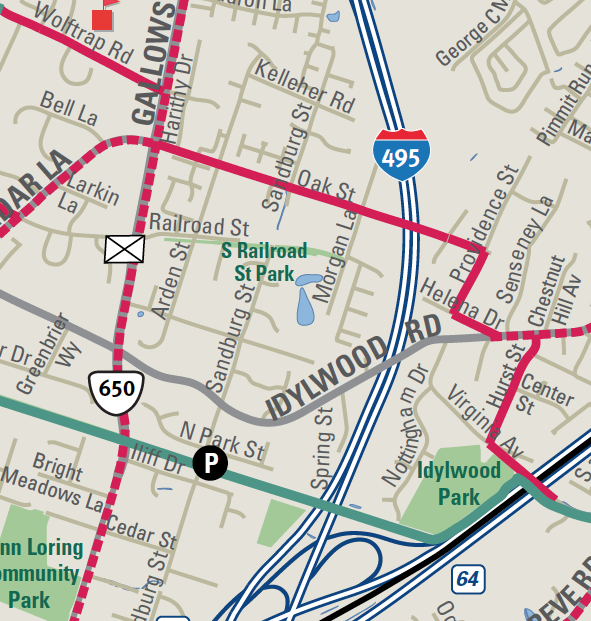 One very positive outcome of the meeting was an agreement that VDOT would provide wayfinding signage where the Parkway trail detours around the I-66 bridge. We've asked for this signage since 2005. We hope this is a first step in providing much needed wayfinding signage along the full length of the trail, especially in the north section where there is no signage. VDOT also said there are funds to begin making much-needed repairs to the Parkway trail. The final paving of this Fair Lakes trail section will occur in the very near future. The trail may be closed again briefly for that repaving. Let's hope proper notice is given to trail users. If the trail is closed, this is our recommended detour on the right. Representatives from WMATA will give a presentation on bike facilities at the soon-to-be-opened Silver Line Metro stations in Tysons. They will also provide general information on using bikes on Metrorail and Metrobus. Fairfax Dept. of Transportation staff will discuss new bike facilities planned in the Tysons area that will facilitate biking to the stations. The Tysons Bike Group meeting is open to everyone and will be held at noon on Tuesday, April 16 at PricewaterhouseCoopers, 1800 Tysons Blvd. If you would like to attend the meeting please RSVP to chairman at fabb-bikes . org. Plan to arrive at the PwC building to allow time to sign in and be escorted to the meeting room. While lunch is not provided you are welcome to bring lunch to the meeting. 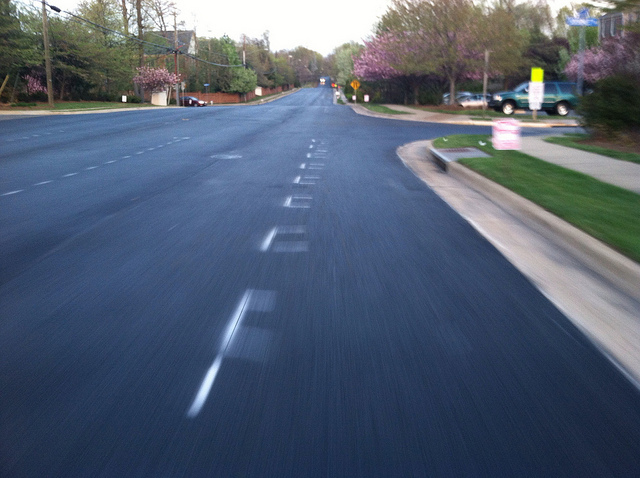 VDOT is implementing another road diet project in Fairfax County this week that will create new bike lanes on Oak Street in the Dunn Loring area. Many westbound cyclists use Oak Street when riding to Tysons from the W&OD Trail (see county bike route map on the right). It's a relatively quiet neighborhood street that was discovered by many motorists when the Idylwood Rd bridge over the Beltway was under construction and Oak St was on the detour route. 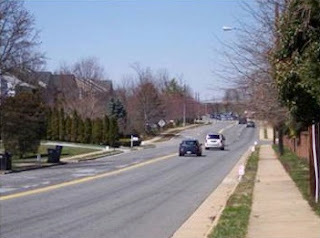 Dunn Loring, Va.─A section of Oak Street in the Dunn Loring area of Fairfax County is going on a “road diet,” losing two of its four thru lanes to reduce excessive speeding and make the road safer for motorists and bicyclists alike. The Virginia Department of Transportation (VDOT) will re-mark the pavement on or about April 15 as part of a previously planned paving project. The project begins east of Gallows Road where Oak Street is 40 to 48 feet wide and two lanes in each direction, which is much more capacity than needed to handle 3,000 vehicles a day. The pavement freed up by removing one lane in each direction will instead be used for new left-turn lanes, designated parking on the south side of Oak, and bike lanes in each direction. About two-thirds of drivers on Oak Street exceed the 30 mph speed limit, and nearly 15 percent of vehicles travel over 40 mph. One of the benefits of road diets is a reduction in the fastest speeds. This is VDOT’s third road diet project in northern Virginia. Diets on Lawyers Road and Soapstone Road in Reston have resulted in fewer crashes and reduced speeds. Update 4/17/2013: Here is a photo of Oak street ready to be restriped with bike lanes. According to the Falls Church Patch article Falls Church Police Out Patrolling W&OD Trail, citations are being given to cyclists who don't come to a complete stop at the W&OD Trail STOP signs. There is a Falls Church ordinance that requires bicyclists to stop at all stop signs: Article IV, Sec. 26-109, 3. Stop signs. All persons operating a bicycle shall stop at all stop signs. The state code, 46.2-821, only applies to a cyclist on a roadway, not on a trail, so if you're issued a ticket, hope that the state code is used since there's a good chance the ticket will be dismissed if contested. Thanks to Senator Favola, upon the request of Loudoun County officials, the Virginia legislature recently passed a law, Senate Bill 959, which "Allows local governing bodies to adopt ordinances requiring users of shared-use paths to stop before crossing highways at marked crosswalks." One problem with such an ordinance is that police tend to have a very literal definition of what "stop" means, often using a double standard, requiring cyclists to put a foot down while most motorists roll through stop signs. The other problem is the contradiction between having a STOP sign adjacent to a crosswalk, and knowing when a cyclist can enter the crosswalk where a motorists is required to yield. Kudos to Jeff for all the work he does getting more kids on bikes. Is your school holding a Bike to School Day event? If not, why not consider offering to help organize an event? For more info on Safe Routes to School in Fairfax and other articles about local efforts, see the FABB Safe Routes to School page and the Fairfax County Public Schools SRTS page. Update: This article was reprinted in the Post Local section on April 18. According to the article Police step up efforts to quell pedestrian- and cycling-related crashes: Cycling hit-and-runs have doubled, Fairfax police have significantly increased the number of "citations written for pedestrian-related violations over the last two calendar years." In 2010, 213 citations were written compared with 582 in 2012. As we reported earlier, the number of bike crashes last year (106) was a 26% increase over 2011. The number of hit and runs doubled, from 6 in 2011 to 12 in 2012. Police said that starting this month, enforcement and education efforts concerning pedestrian safety have been stepped up across Fairfax County. Efforts began April 6 with a focus on areas near the two Metro stations in the McLean District. Commuters in those areas this month can expect to see officers monitoring crosswalks, posting electronic signboards and strictly enforcing traffic laws for both drivers and pedestrians. Tickets and warnings will be issued for drivers who are exceeding the speed limit, not yielding to pedestrians and committing other violations. Pedestrians will also be expected to use crosswalks and comply with existing laws. “That also goes for cyclists,” said police spokesman Bud Walker, who compiles bicycle crash statistics for the Fairfax County Police Department. Good afternoon. My name is Bruce Wright, Chairman of Fairfax Advocates for Better Bicycling. 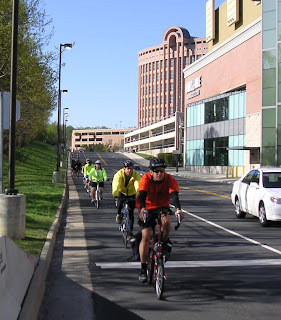 FABB represents cyclists in Fairfax County. If there were a simple device that could help solve the obesity epidemic, ease traffic congestion, reduce work absenteeism and reduce air pollution, I think most people would support it. In fact, most people have one of these devices in their home, the bicycle. Many people have told us that they would bike more if we had a complete bicycle network and conditions were safer. I'm here today to ask for funding for the bicycle program. The bicycle coordinator has project funds but has had no operating funds for the past three years for running an effective, comprehensive program that includes encouragement, education, and evaluation activities, and an up-to-date website. The good news is that there are project funds to build bike facilities in Tysons and Reston to improve bicycle access to the Silver Line stations. It's a smart investment to improve bike access in these areas of transit-oriented, mixed-use development. The other good news is that the bicycle master plan was completed in July 2012 and will be a roadmap for making Fairfax a bike-friendly place. 300 people attended 8 area meetings to provide input to the plan; that's probably more than attended the county transportation dialogues last fall. When the bike plan comes before you, we ask that you support the plan and allocate funds for implementation. Otherwise we will fall further behind neighboring jurisdictions. On May 1 of last year Supervisor McKay directed staff to investigate whether the BikeArlington model would work in Fairfax. BikeArlington has 3 full-time staff, in a county with ¼ of our population. Those staff conduct bike classes and seminars, sponsor local events, and work with employers to get more people on bikes. Their bicycle mode share is about 3 times that of Fairfax. We think BikeArlington a good model for Fairfax County and a similar program should be funded and implemented. Until a few years ago cyclists could report aggressive drivers using the Aggressive Driver Report Form. Because of budget cuts, that form was eliminated, even though the Report a Litterer program is still being funded. We're asking that funding for the aggressive driver program be reinstated. FABB members are willing to provide volunteer help if needed. We're hopeful that more bike facilities will be funded as part of the Transportation plan recently approved by the Virginia legislature. When those projects are built it's imperative that temporary access for bicyclists and pedestrians be part of every project. 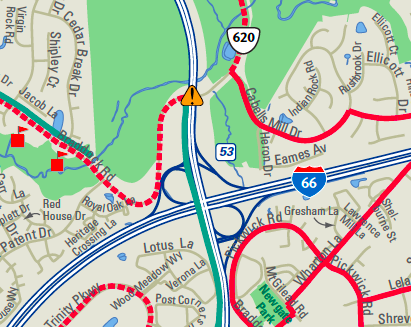 That wasn't the case when the Fairfax Co Parkway Trail was closed for nearly a year during the Fair Lakes interchange construction. We can't expect people to use bicycles for transportation if VDOT completely closes a major trail like the parkway trail. Trail maintenance has been neglected for far too long. The Braddock Road, Fairfax County Parkway, and many other trails are not safe and need to be repaved and otherwise maintained. We have a good basis for a connected trail system but it's falling apart without proper maintenance. A sign of the importance of bicycling as a transportation option is the excitement we're seeing about bike sharing. Capital Bikeshare is a phenomenal success in DC, Arlington, and Alexandria, with users logging over 3.5 million trips. It can work in Tysons and Reston; it's a great first- and last-mile solution and should be considered an extension of the public transit system. It's not just us advocates who see the possibilities. However, for bike sharing to work, we need better, safer places to ride. The route I use for my bicycle commute to work is a little over twenty miles in length. By the time I reach Fairfax County I am halfway there. I normally prefer to ride on the road or in a bike lane on the road, as I consider it safer. However, since I have been pedaling for about 45 minutes at the time I reach Braddock Road I prefer to use the bike trail that runs parallel to the road. The fact that drivers are driving into the sun and are often driving too fast and distracted also encourages me to take the bike path. Using the bike trail along Braddock Road is both a blessing and a curse. I like the opportunity to take my time, relax, look at the scenery, and take breaks along the way, which makes using the trail a wonderful option. On the downside the trail is somewhat hazardous. Debris, glass from broken bottles, craters in the pavement, grass growing up, or encroaching onto the trail, and other obstacles can create an unsafe travel environment. Having to replace a flat due to the condition of the trail, or having to replace a tire costs money and time. Worrying about the condition of the trail results in slower travel and more worries about safety issues. Often I come across debris from accidents that have been piled up onto the trail making it unsafe for bicyclists. Gravel, and other debris, is a frequent issue I encounter when crossing over traffic cuts in the trail. In the winter time when it snows the snow is plowed up onto the trail making it impossible to use. This year when it snowed the snow plows left dirt clods and pieces of asphalt on the trail which are yet to be removed. The Braddock Road bike trail should be repaved. A maintenance plan should be established for repairs and clearing debris off the trail. By taking these steps Fairfax County will be creating a safe, and fun, transportation option for bicyclists, and pedestrians, to negotiate their way through the county. The Braddock Road bike trail provides an important connection in bicycling from Prince William County, and western Fairfax, to Arlington and Washington, D.C. Once you reach Route 123 you can transition from Braddock Road going through the City of Fairfax over to the W&OD trail and head east to the District. About Rick Holt - Rick has over 15 years of experience in the field of learning and professional development and is currently a trainer at George Mason University in HR & Payroll. Rick is also a graduate student in the field of Sport and Recreation, with a focus on exercise, health promotion and the sport of cycling. He is a certified bicycling safety instructor through the League of American Bicyclists. Rick frequently commutes the twenty plus miles from home to work on his bicycle. Rick is also the chair of the Prince William County Trails & Blueways Council. The mission of the Council is to advise the Board of County Supervisors in the development of a County-wide trails and blueways system in Prince William County. Is your local school celebrating Bike to School Day? Last year around 25 Fairfax schools participated and the goal for this year is to double that number. Why not contact your local school and ask if they are supporting the event? You could volunteer to lead a bike train to the school. If the school does not have bike parking, ask for a rack. If you are told that biking is not allowed at the school, point out the new school policy that parents make the decision whether their kids can ride, not the principal. SO, I challenge you to call your local elementary school and ask the administrators and PTA, 'what are you doing for Bike to School Day?" For little kids, even having those who rode stand up during morning announcements and be recognized goes a LONG way toward encouraging that behavior for the future! Let's get our kids OUT of cars and buses and outside where they belong! Jeff has found that the bike train program also helps students become more physically fit. The route that the train follows takes students up a short, steep hill. When Jeff first started the bike train, some of the kids had to walk their bikes up the hill. Now he sees those same kids easily navigating the hill. In fact, some of them practice the hill so they don’t have to get off the bike in front of their friends. Teachers report that biking helps prepare students for the day so that they are more ready to learn. They aren’t groggy, and biking to school gets their blood pumping and the chattiness out. We recently appeared on the Channel 28 show Reston Impact hosted by John Lovaas. The title of the show as "Bicycling - One Answer to Gridlock?" Not sure why the question mark was there as bicycling is one of the best answers to gridlock. The focus of the show was about cycling to the new Wiehle Ave Metro station scheduled to open in Reston the end of this year/first of next year. Anne Mader of The Bike Lane was the other guest. The conversation was wide ranging but we didn't cover several topics related to biking and Metro so we have been invited back for a second taping. Reston Impact March 2013 from Comcast Channel 28 on Vimeo. Fairfax County had 106 reportable crashes involving bicycles in 2012, which is approximately a 26% increase in bicycle crashes over 2011. Twelve crashes were a hit and run where a bicyclist was struck and the motorist fled the scene. None of these crashes involved the death of the bicyclist. In 43% of the crashes, the bicyclist was held at fault. [In 53% of the crashes, the motorist was held at fault. Comment added]. The leading cause of most crashes involving bicyclists was one party failing to yield the right of way. In 19 crashes (18%) the bicyclist was found to not have the right of way and in 30 crashes (28%) the driver was found to not have the right of way. There were 12 hit and run number, was double that of 2011 in which there were six. 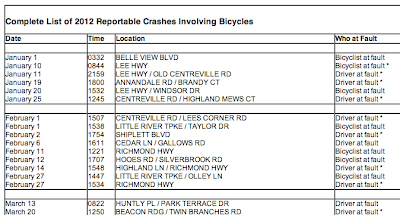 Even though the crash site states that there were no fatalities last year, there was one bike crash fatality, on November 12 at Ashwood Place and Columbia Pike. We've pointed this out to the crash analyst. We used a program called BatchGeo to geocode the data and produce a draft crash map but there are several suspect points so the map needs a lot of editing. We're hoping Fairfax Police will produce a map using their GIS system. Here is a link to the 2010 Fairfax Bike Crash Map.